Incoming President Donald Trump took to Twitter around 8:30 a.m. Monday morning and said the cost of Lockheed Martin's F-35 program is "out of control." Trump tweeted that "billions of dollars can and will be saved on military (and other) purchases" once he sits in the Oval Office in January. Within minutes, the tweet was retweeted more than 3,000 times and had more than 10,000 likes. Lockheed Martin shares fell 3.67% to $250.00 right after today's opening bell. Trump's swipe at Lockheed Martin and its F-35 is just his latest against car, manufacturing, and other companies since his presidential win on Nov. 8. Lockheed Martin's F-35 Lightning II is a fifth-generation fighter that combines advanced stealth with fighter speed and agility. The variants of the F-35 will replace antiquated legacy fighters for the U.S. Air Force, U.S. Navy, U.S. Marines, and 10 other countries around the world. The F-35 Lightning II was designed to be an affordable fighter jet. Yes, the F-35 program has experienced several developmental delays, cost overruns, reassessments, and changes since 2006. The next-generation fighter jet, which is near completion, has exceeded the original budget by 50%. The military has spent roughly $1.5 trillion on developing the F-35. Still, the U.S. government and F-35 team have continued to reduce F-35 costs in the future. Since the F-35 program Technical Baseline Review in 2011, the team has studied and successfully implemented numerous affordability measures. In fact, production costs have dropped 55% since the first F-35, according to Lockheed Martin. 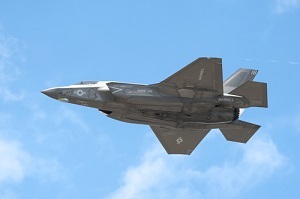 The most recently contracted costs for the three fighter jets are $98 million for the F-35A, $104 million for the F-35B, and $116 million for the F-35C. An F-35A purchased in 2018 and delivered in 2020 will be $85 million, which is equivalent to $75 million in today's dollars. With its new F-35s, Lockheed Martin clinches its spot as the dominant player in military aerospace.